Hi friends. I'm going to tell you a really good tips again, all of you. Who has not yet told anyone. 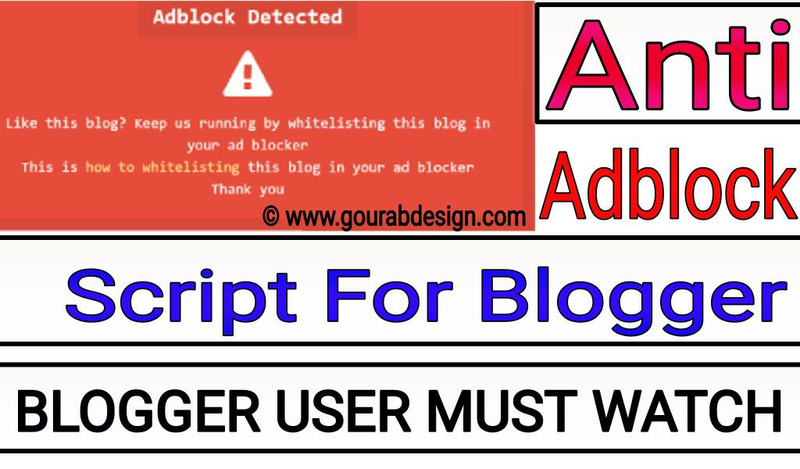 The creator is my subject How To Install Latest Version Anti Adblock Killer Script In Blogger..In this post I will tell you about an adblock script. You can use it for free from Lifetime. And the money you are earning from this can also increase. Then it started again now. Friends, you will know about Adblock. If not know then it does not matter. I am telling here... Adblock is a function that is in every browser. Or there is an extinction that someone uses when it comes to your site Then your site does not see the advertisements sent by the admin. Meaning whichever comes to your blog using this function So, he will not see any content that will be sent to your blog. Only your written article and image will look like. I said above that how bad it can have on your earnings. So you have to stop it for yourself. If you want any traffic on your blog and all of them are appearing advertisement, then I am going to tell everything here. Don't worry ok. I'm giving a script below that you have to add it to your blogger. And after getting it you will get a lot of benefit. You have enabled the Adblock function So please Disable It. Then View Our Site Content. ✓ Now Click the template option. ✓ Now a box will open in front of you which will contain the code.